The ExpressionEngine Control Panel is slick and inviting. Traditionally, one of the main problems of using a content management system (CMS) such as Wordpress is that your website ends up looking like a Wordpress website. Meaning, no matter how much you play with the graphics, colors and typography, the basic layout of the page often still looks like it was made with Wordpress. ExpressionEngine solves this by being completely open-ended and not enforcing any sort of hierarchy or default layout. In fact, when you first install it, your homepage shows nothing: Just a blank, white page, completely devoid of any markup or skeleton structure. This makes building a new website significantly harder, but it also makes it possible to achieve almost any layout you can think of. 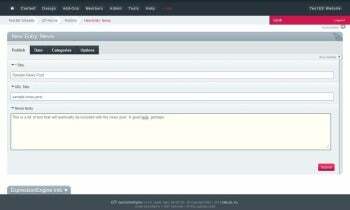 ExpressionEngine has you define your own content types and fields. 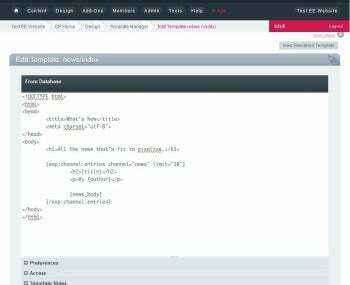 ExpressionEngine uses a combination of HTML and its own special tags for rendering content. ExpressionEngine is priced to make it easy to get started: EllisLab offers a $100 Freelancer license, which you can use exclusively for building your own website. The next level up is the $150 Non-Commercial license, strictly for non-commercial, non-profit, or educational websites. If your project is commercial, you will need the Commercial license, which costs $300. If you are an experienced Web developer looking for a powerful CMS that allows complete customization, check out ExpressionEngine, but be prepared to spend some quality time with the documentation. Note: The Download button takes you to the vendor's site, where you can buy the latest version of the software. ExpressionEngine is a powerful and complex content management system for professional Web developers.